To say Robert Stock took a circuitous route to Triple-A would be too simple. Once one of the most promising youth players in the country, Stock has worked through a career notable for its peaks and valleys. By the end of 2014, the Cardinals' 2009 second-rounder was released. By May 2015, he was with his third organization. By 2016, he was out of affiliated baseball, with little choice but to admit that some of his weaknesses got exposed in the pro game. At age 28 this season, he's at the highest level of the Minors. He's also at a crossroads, and he's hoping one of those roads eventually leads to the big leagues. "Not having made it [to the Majors] is the easiest motivation to keep going," the right-handed reliever said. "When I was younger, I played with a long list of guys who are superstars now. I was on the field with these guys doing the same thing. I played on Team USA with Freddie Freeman; I remember catching Rick Porcello at a USA Tournament; I played with [Eric] Hosmer at USA Baseball." He reached Triple-A for the first time this month after striking out 15 over nine innings at San Antonio, the Double-A affiliate of the San Diego Padres. 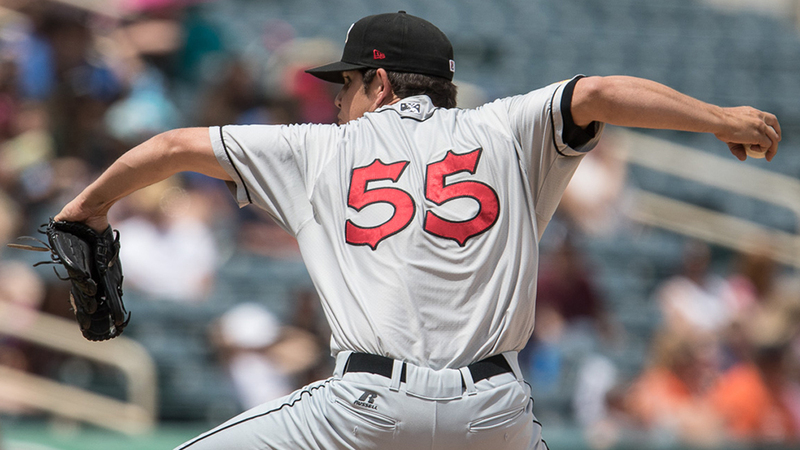 He fanned seven in eight innings over his first seven appearances since being promoted to Triple-A El Paso, allowing a pair of runs on three hits and three walks. As a 15-year-old high school student in Agoura Hills, California, Stock drew major attention for his ability to throw 95 mph at such a young age. He was so well-regarded that he skipped his senior year to enroll early at the University of Southern California and played right away. What followed was a mixed career at USC. He was the starting backstop for his freshman and sophomore seasons, but he struggled so much offensively as a junior that the Trojans switched him to the mound. He thrived. The Cardinals made Stock the 67th overall Draft pick in 2009 -- the same year they selected right-hander Shelby Miller with their first pick -- but took him as a catcher. St. Louis was initially rewarded for ignoring his collegiate offensive struggles: Stock hit .322 and was an Appalachian League All-Star. But he batted just .213 in 2010 and .240 the next year. By 2012, he was converted to a pitcher once again. He still couldn't get past the Class A Advanced level, and he wasn't especially pleased about the move from behind the plate. Unlike some players who abhor the so-called tools of ignorance, Stock enjoyed it. "I loved [catching]; you're in every single play. Every single pitch, you feel like, 'That's half my complete game,'" he explained. "It was one of those things that the person who signed me as a catcher, Jeff Luhnow, he was farm director with the Cardinals, and he left to become GM of the Astros, so there was a different farm director for the Cardinals and they had differing opinions of where they see me in the future. When they change you over, you really have no [recourse]. If you say no, you get put on the reserve list and you can't play anywhere else. So, immediately, I went out and practiced the next day. I like to think of myself as reasonable and analytical. If you're emotionally not into it, you won't make it." The move also blindsided him. "That was so surprising," Stock said. "I had a bad year in 2010 [but] was invited as a catcher to big league spring. During Spring Training, it was just 24 hours after Yadier Molina signed the big extension and [Cardinals manager] Mike Matheny called me into his office and said, 'We're going to shift you to pitcher.' You'd think if it was about my performance, that would have happened in the offseason." While Stock might have been surprised by the move, Cardinals scouts were not. Talent evaluators had projected that Stock, with his power arm, could turn to the mound and succeed. "We all liked him as a right-hander if the position did not work," said Jamal Strong, a national crosschecker for the Cardinals who signed Stock when he was an area scout. "I saw him pitch at USC, and it's funny because he would catch during midweek games and also on Friday and Saturday nights, and he was also the closer on the team for those games. We thought he had an outside chance at becoming a starter because he did have a good three-pitch mix with good [velocity]." Still, Stock didn't have much more luck as a pitcher. He reached the Class A Advanced level in 2013 but was demoted to Class A after walking 25 batters in 23 1/3 innings in 2014. That December, St. Louis cut him loose. "When I was with the Cardinals, I was just awful," he said. "I don't have any ill will [about my release]." Strong kept an eye on his signee. "I tried to reach out to him after he was released, but it's always tough to talk to kids after they are released because that moment hurts," the scout said. "I just try to let them know that if they want to keep playing, they should not ever give up on their dream, because you never know what can happen." Stock signed with the Astros in March 2015 -- not a surprise, since Luhnow, who drafted Stock, was now the GM in Houston. He lasted less than a month in Spring Training before finding his way to the Pirates, where he pitched very little over the next two seasons. Frustrated but not willing to walk away from baseball, Stock asked agent Joel Wolfe -- who also represents Giancarlo Stanton and Yu Darvish, among others -- to let teams know he still wanted to play. With no Major League organizations interested, he decided to try independent ball, signing with the New Jersey Jackals of the Can-Am League. "With the Pirates [in 2015], I pitched so few innings not because I was injured [but] just because I was the last guy in the bullpen," Stock said. "So the next year, when I signed in indy ball, I said to the manager, 'Pitch me as much as you want.' And I ended up breaking the league record for appearances . Coming off that experience, I saw the uptick [in velocity]." "I tell myself that I can play in the big leagues, but then when you go out and prove it to yourself, it's another level." Stock is grateful for his independent ball experience and was struck by the quality of play. "Indy ball was a lot better competition than I thought," he said. "A lot of guys played Double-A and Triple-A, and it was not like they failed terribly. They just weren't going to be Major Leaguers. "The coolest thing about indy ball is, it's about winning every game. It's not about developing players. It's not, 'This guy needs to play every day, even if he's not doing well.' Our team had the best winning percent in franchise history [.620], and if we won we didn't have to take batting practice the next day. So we're in Quebec City, which is a great city for nightlife, and we said, 'Hey, coach [Joe Calfapietra], it's so-and-so's birthday tomorrow. We need to just do a 'show-and-go', and he said, 'Just win the game and it's fine.'" More importantly, Stock worked with the sports training staff at Phoenix-based Evo Ultrafit, whose clients include several athletes -- most notably Nationals right-hander Ryan Madson. "It's the same people who helped Ryan Madson, who after not pitching for three seasons because of elbow injuries, last year he throws 100 [mph]," Stock said. "It's a unique muscle stimulator that I use for hours a day. I'm always hooked up to the stim in the offseason, and I can have maximum intensity sessions every day. For other guys, that would be insane." Thanks to his indy ball stint and his work with Evo Ultrafit, Stock had the tools to get back to affiliated ball. But he still needed some help. As well as Stock pitched in the CamAm League, he knew it wouldn't be easy to get the attention of big league clubs. "As a Minor League free agent, no one truly believes in you," he said. "You have to be not just as good, but far better than the next guy. The organization drafted that guy and they have more invested." Luckily for Stock, he had help, and not just from his high-powered agent. Then-girlfriend and now fiancée Sara Krutewicz acted as Stock's personal cameraman and social media editor. "In February 2016, she sees my offseason [training] and sees I start throwing 98, but nobody knows that," Stock said. "So she takes a video of it, and I post it on Facebook in a group for professional baseball players, and the next day I start getting calls from scouts." That helped Stock land a job with the Reds, and he pitched in 2017 at Class A Advanced Daytona and Double-A Pensacola, going 9-5 with a 2.98 ERA in 41 appearances. He remains grateful for Krutewicz's assist and understands the patience needed from a ballplayer's spouse. The two met in 2014 when Stock was still in the Cardinals organization. When Krutewicz was on spring break in Miami with a friend, her friend used a dating app and matched with Stock's roommate. Stock went along to balance the foursome. "Yeah, it's not every girl that would stick with me," He said. "But she's very unique. She says, 'Baseball is your future.'" A free agent again after 2017, Stock got Wolfe's help to land a winter ball spot in the Mexican Pacific League, which led to his latest chance. "My agent has [Stanton] and Darvish, so he's not going to worry about me so much, but he's a great guy and we're good friends and he'll give me good advice," Stock said. "He's calling teams and getting me a winter ball job, and [former Charros de Jalisco manager Tony Tarasco] in winter ball was [also] a field coordinator with the Padres, and when he saw me pitch, the manager called the Padres and a scout was there the next day, and I got signed." El Paso pitching coach Bronswell Patrick believes Stock has big league stuff. "We saw a big arm, a guy who has Major League ability, and he pitched well in big league camp," Patrick said. "This kid has worked hard; he was a catcher before coming out of college and he's done a good job of making adjustments. Of course, when you throw 100, it makes it easier. "He's intelligent [and] he gets along well with his teammates. We have a mixture of guys, older and younger, and he mixes in well with the guys. He's always interacting with other guys, and he's a joy to watch." Stock pitched well enough in Spring Training that he was one of the final cuts. He impressed coaches by touching 100 mph and fanning a couple of big league stars. "I got to stay to almost the very end and strike out [Kris] Bryant and [Anthony] Rizzo back to back, and I tell myself that I can play in the big leagues," he said, "but then when you go out and prove it to yourself, it's another level." Even now, just one step from his final goal, Stock won't rush things. "There's so many things still to learn," he said. "I think I'd float, I'd survive in the Majors now, but the more time I spend here, the more honing of my skills." And as long as he has that opportunity, he's not going to give up his dream of reaching the big leagues. "One offseason, I was living in my parents' basement and I was playing video games and my mother said, 'Go out and do something," and I said, 'Mom, relax. I'm going to play in the Major Leagues someday.' I believe I will, even if it takes five more years."